Thousands of years ago, Ayurveda described multiple levels of the radial pulse that could be used to interpret the status of the organs and systems of the body as well as the mental and physical constitutions of the individual. For the first time in the West, this book presents this ancient art and provides a method by which anyone can learn to read his own pulse. Imbalances and potential disease states can be detected in their early stages, giving one the opportunity to correct them before they affect the quality of life. With practice and guidance, one can acquire the proficiency to use this knowledge to heal self and others. Because of the interest in Ayurveda in the hearts of both practitioners and laymen and because of the demand, I have been teaching seminars on pulse diagnosis across the United States, England and at the Ayurvedic Institute in Albuquerque, New Mexico. In any system of medicine, pulse assessment is a matter of technical skill, subjective experience and intuition. Accuracy also depends upon the individual's persistent practice and quality of sensitive awareness. Several teachers, gurus and yogis in India influenced my early education in pulse reading. Even though simplified descriptions of various conditions of the pulse are found in the standard Ayurvedic texts, the methods of examination are not given in detail. However, it is possible to learn these subjective methods of pulse examination that reveal the characteristics of the individual's prakruti, vikruti and various doshic disorders and to verify their accuracy objectively. The purpose of this book is to teach simplified techniques to students and to provide deep comprehensive information as well. 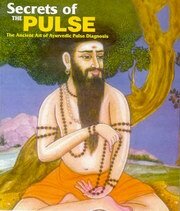 Throughout my earlier Ayurvedic education, I also studied modern allopathic medicine and this knowledge has broadened my interpretation of pulse reading. All of what I am sharing with you in this book may not be found in the standard Ayurvedic texts. However, all that I have included here is based upon Ayurvedic principles. I received this knowledge from my mentors in the Ayurvedic tradition and it has since unfolded in my heart through clinical observation and practice over the last 25 years. This book will give guidelines to think about various ways of feeling, reading and gathering information through the pulse. It is quite difficult to put subjective experience into words. This is my sincere attempt to express these simple ways of feeling the pulse. I hope, dear readers, that you will love this humble effort. Dr. Lad brings a wealth of classroom and practical experience to the United States. He received the degree of Bachelor of Ayurvedic Medicine & Surgery from the University of Pune, in Pune, India in 1968 and a Master of Ayurvedic Science from Tilak Ayurved Mahavidyalaya in Pune, India in 1980. For 3 years he served as Medical Director of the Ayurveda Hospital in Pune, India. He also held the position of Professor of Clinical Medicine for seven years at the Pune University College of Ayurvedic Medicine, where he was an instructor for many years. Dr. Lad's academic and practical training includes the study of allopathic medicine (Western Medicine) and surgery as well as traditional Ayurveda. In 1979, he began traveling throughout the United States sharing his knowledge of Ayurveda, and in 1981, he returned to New Mexico to teach Ayurveda. In 1984, he founded and began as Director of The Ayurvedic Institute. This book takes one deeply into the ancient science of the pulse. The pulse carries so many levels of information that the skilled practitioner can read and use to guide a patient to good health and enlightenment. Dr. Lad teaches in the Gurukul tradition, spontanously and with full heart. I was lucky to attend a few of his sessions in Pune he does each year and feel he is a living example of Ayurvedic wisdom. This book is a treasure of information and for the serious student is the best manual out there. This book takes one deeply into the ancient science of the p ..